Ingrid and Irene, the children of the Jewess Irma Eckler, had to grow up separated from each other and without their parents. They survived persecution and war. When she was over fifty, Irene, born in 1937, began to investigate her past - a past, which had hitherto been repressed. Although her search for clues to the past had begun late in life, it nevertheless brought some amazing facts to light. From books, films and television programs, Irene built up a picture of the Third Reich and was able to place her experiences in an historical context. Above all, she gained a better understanding of her parents, both of whom met violent deaths. She had no recollection of her mother and only once had she consciously met her father. She visited Hamburg to find out about her mother from surviving relatives. She also sought out her sister and they exchanged memories, letters, pictures and documents. 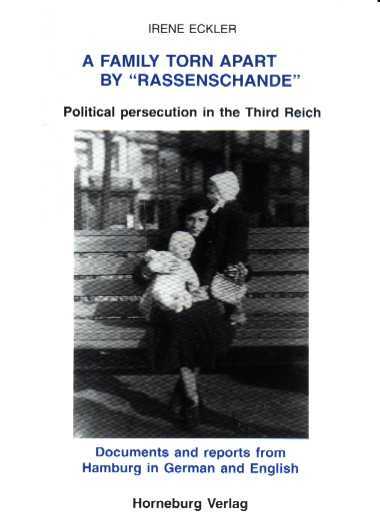 Irene discovered that her Guardianship File was likely to be found at the Amtsgericht (Lower Court) in Hamburg. And so it was. The file became the guideline to the investigation of her past. Irene Eckler would like to take this opportunity to express her thanks to Mister Alfred Hillert for his friendly advice and help in compiling this manuscript. The English language version of the text had been translated by Jean Macfarlane. The author and the Research and Study Center for Holocaust Education do hope that through this service many people will get access to this story, who would not have had a chance without this website.